It's cool to be high. North Carolina in July can be hot and steamy--at least where most people live. But not in the mountains. 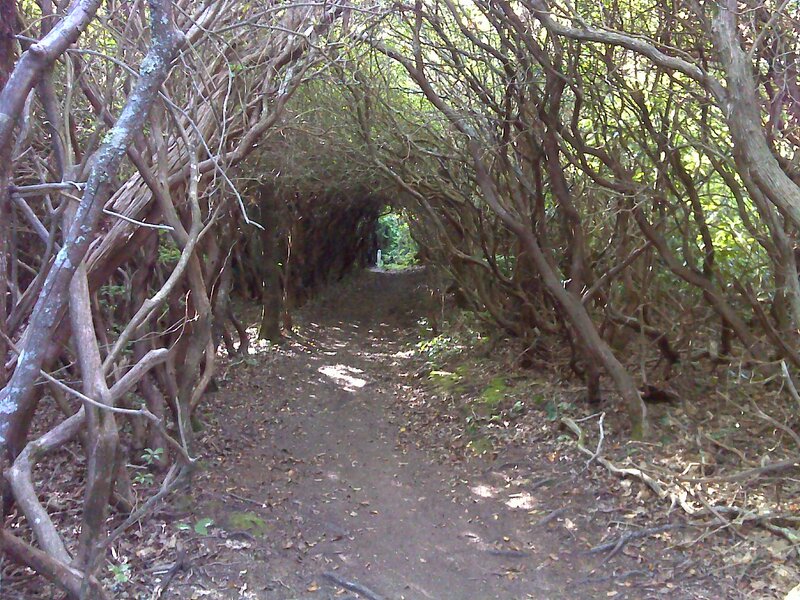 Up on the 'Mountains' portion of NC's Mountains-to-Sea Trail there's relief. High elevation means cool temperature. The rule-of-thumb is that for every 1000 feet of elevation you gain, you lose 5 degrees Fahrenheit. 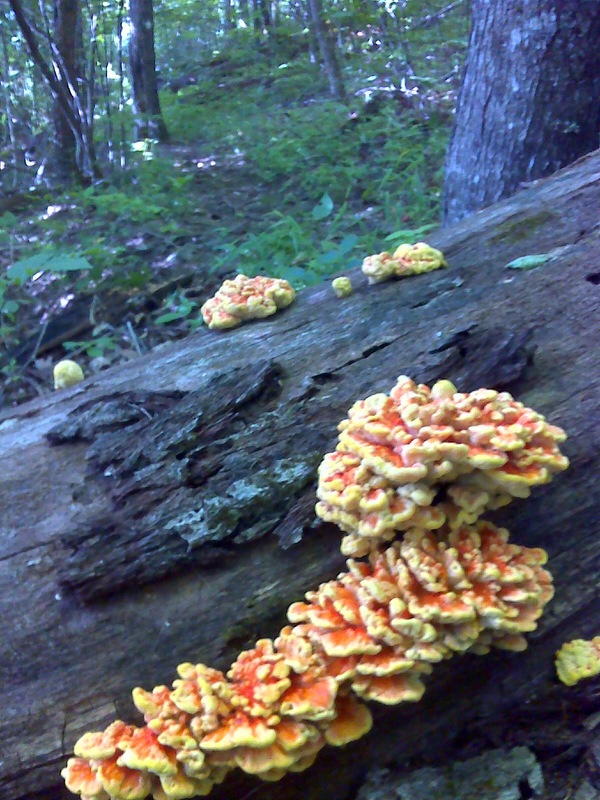 In my recent hikes there, I had days where I barely broke a sweat. 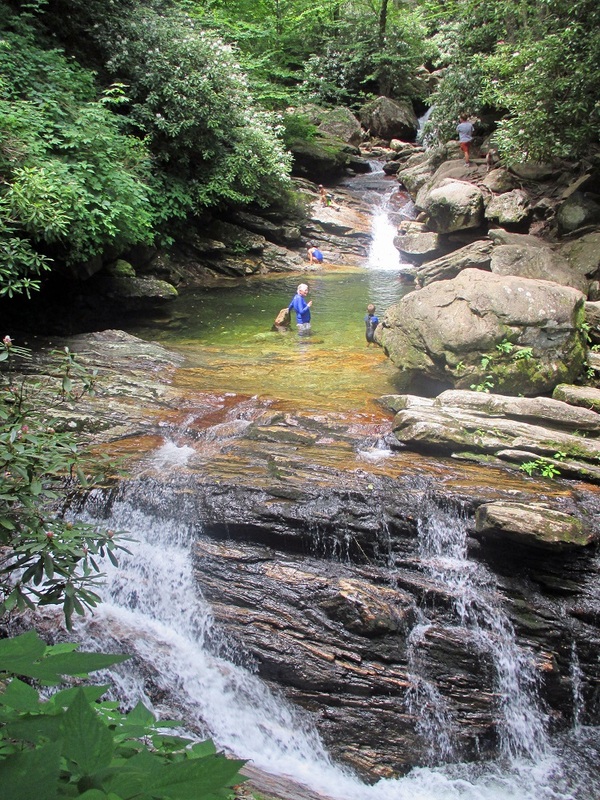 The kids who were dipping in the pools at 'Skinny dip falls' shown above, were shivering. The key is to stay high. The segment of trail I'm covering in this report starts high and ends high and never gets lower than 3700 feet. Graveyard Fields is a broad valley floor above 5000 feet in elevation surrounded by 6000 foot ridges. 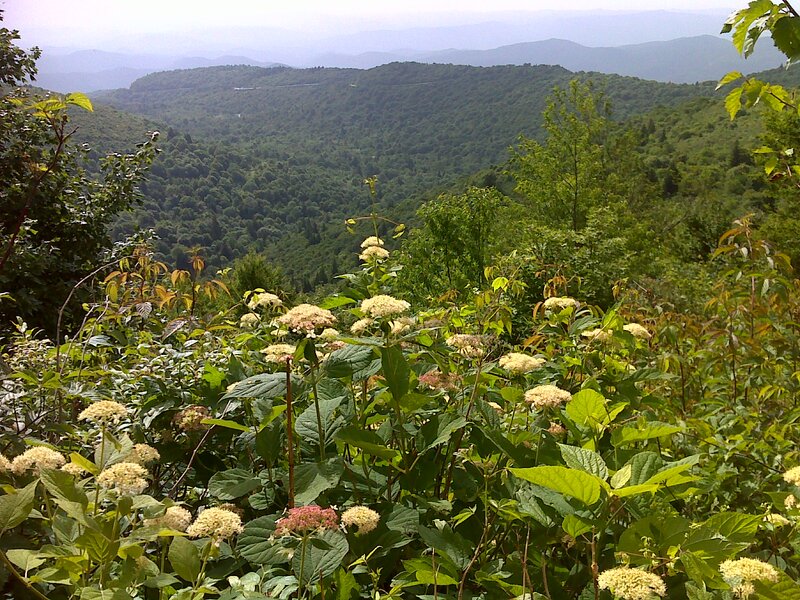 The Pisgah Inn, a popular resort for outdoors-lovers, sits on a ridge at nearly 5000 feet. Between the two the trail dips down to the lower 4000's to pass the popular and noisy cascade and swimming hole shown above and to follow a quiet, serene century-old path called the Buck Springs Trail that once brought visitors to the rustic old original Pisgah Inn. Graveyard Fields is a name that evokes Halloween imagery. It is said that the place got its name because after the area was clear cut nearly a century ago, the remnant stumps grew over with moss such that the whole valley looked like an old neglected cemetery. 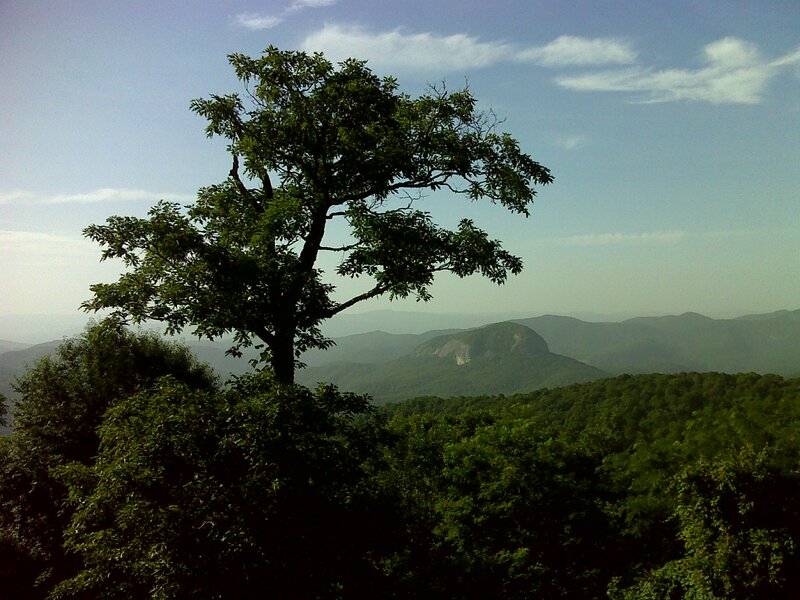 The MST doesn't traverse the valley, but swings around the opposite side of it from the Blue Ridge Parkway. Here's the view back across the valley to the parkway. As I often do, I hiked a segment of trail then return via the Parkway where there are more frequent views. Here's my favorite view among many--this is called Looking Glass Rock. During the heat of the day, even at this altitude, I preferred being in these shady sections rather than out in the blazing sun. Of all the hiking in this section, I enjoyed the Buck Springs Trail the best. It took me far from the road noise of the Parkway, as did the trail around Graveyard Fields, but here I was in peaceful hardwood forest on a former roadbed that meandered back and forth along the steep side slope keeping a very steady incline. 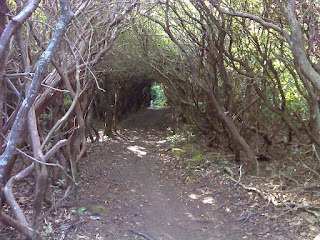 This, I am told, was an old motor road built before the Blue Ridge Parkway was constructed. It's hard for me to imagine that vehicles could have used this narrow path. 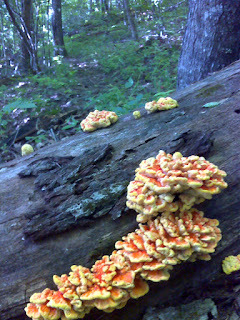 I didn't take pictures other than this somewhat blurry fungus shot. The path is behind. But there were places where the side-slope was steep and the footpath was barely two feet wide. Then below the Inn there were a series of eight sharp switchbacks, so sharp that it appears to me that vehicles would have had to alternate between forward and reverse as they made the switches. Ah, well ... rain and snow have been at work for nearly a century since the days when Model T's bumped their way along this road. The country store beside the Inn was a welcome oasis on an afternoon that felt hot because of the blazing sun. I stopped in and bought a bottle of ice cold orange juice. The cool was such a high! Here's the map of my wanderings.